MANILA, Philippines — Art runs in the blood of Paulina Luz Sotto. A granddaughter of National Artist for Visual Arts, Arturo Luz, Paulina has always been surrounded by art and artists for most of her life. But her artistic awakening, so to speak, did not come until she was 25. Paulina’s fascination with the line — a straight, a one-dimensional figure so simple yet so beautiful — sparked her passion for abstract art. After a few years of painting for leisure, an old friend asked if her abstract paintings were for sale, and that is how it all started. A Communications graduate from Ateneo de Manila University, Paulina is now, like her grandfather, a fulltime visual artist, having had two successful solo exhibits, as well as group shows. She has sold hundreds of paintings since starting out and shows no sign of slowing down. 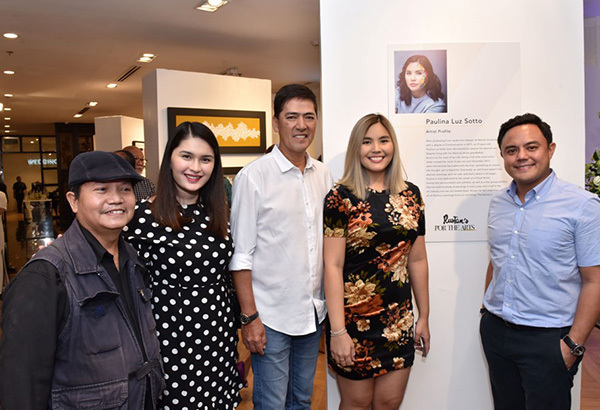 Stepping away from the shadows of her National Artist grandfather and showbiz icon father Vic Sotto, Paulina is making a name for herself in the local art scene, thanks to her clean abstract lines that evoke beauty in its simplicity. A purveyor of high style and a staunch supporter of Philippine arts and culture, Rustan’s has, for decades, not only elevated Filipino design and craftsmanship to the upper ranks of luxury but has contributed greatly in the proliferation of new and more accessible ways in which Filipinos witness and appreciate art. Since the inception of Galerie Bleue by its founder, Gliceria Tantoco, in 1984, Rustan’s has contributed to and raised awareness for arts and culture—from supporting various concerts in the Cultural Center of the Philippines and contributing to the international tour of the celebrated Philippine Philharmonic Orchestra, to most recently translating National Artist for Visual Arts Benedicto “BenCab” Cabrera’s artworks into one of a kind home objects, the highlight of Rustan’s for the Arts in 2016. As Rustan’s moves towards its next 65 years, it endeavors to continue this legacy through Rustan’s for the Arts, a campaign promoting not just the most celebrated Filipino artists and masters but also the up and coming talents in the local Philippine art scene.